Jessica's love for dance started at the early age of three at a small studio in Whitecourt, Alberta. There she studied and competed in ballet, jazz, tap, lyrical, modern, hip hop, musical theatre and highland. In her early teens, Jessica's passion for teaching began when she was given the opportunity to instruct her own beginner classes. This eventually led to her teaching the tap and ballet programs for her dance school. Along with her paid teaching positions, Jessica shared her passion for dance by volunteering regularly for the Boys and Girls Club, Go-Girl Conference (a girls self esteem camp), and other recreational dance programs and elementary schools to help encourage kids creativity and physical activity. As a dancer in high school, Jessica trained many hours per week, which included the opportunity to train on scholarship at The Edge Performing Arts Centre in Los Angeles. Jessica was brought out to British Columbia after being accepted into The Source Dance Company, a semi-professional dance company based in downtown Vancouver. While in The Source, Jessica performed around the Pacific Northwest for events such as the BC Sports Awards, Vancouver International Dance Festival and many other art festivals. From The Source, she branched out to Simon Fraser University’s Contemporary Arts program, where she obtained a Bachelor of Fine Arts in dance, with a Minor in kinesiology and a professional Fitness Certificate. Now a full time instructor, Jessica has retained a passion for performing and continues to perform and choreograph in small productions across Metro Vancouver. Jessica extends her gratitude to the families who make up K.I.M. and feels extremely blessed to have the opportunity to engage young minds through dance and watch them develop as both artists and unique individuals. Megan’s love of dance began at the age of five in a small studio in Abbotsford, BC and grew exponentially from then on. As a child, Megan began with ballet, finding it fun and exciting, but as she grew in her technique, she felt the urge to do more. Megan then decided to become a competitive dancer in a variety of disciplines such as tap, jazz, lyrical, hip hop, musical theatre, and modern. Along with competitions, Megan obtained her Advanced Two Ballet Certificate from the Royal Academy of Dance (RAD). Megan found her passion for teaching in high school, when she was an assistant for her studio's ballet, tap and jazz classes, which led to instructing her own students her senior year. Alyssa Favero is a Vancouver based, internationally trained, contemporary dance artist. She is currently studying Kinesiology at Simon Fraser University. This degree has enabled her to approach dance from an anatomical perspective. Her love for the art stretches to many styles including ballet, tap, waacking and hiphop. Alyssa has been a member of The Source Dance Company where she had the opportunity to work with leading industry professionals including Heather Laura Grey, Amber Funk Barton, Heather Dotto and Joe Tuliao. Her passion for travel has shown her the importance of dance as a form of communication. She has trained at Joffrey Ballet in San Francisco, competed with Team Canada in Bochum, Germany and most recently trained in South Korea and Japan. Alyssa is excited to share her knowledge of dance with another generation. She believes dance training and life training are one in the same. She wants to elevate the dance world by becoming not only a great dancer, but also a great educator. Cleo Halls is a Vancouver based dance artist and community arts educator. A graduate of both MacEwan University’s Theatre Arts program and The Dance Initiative professional training program, she has worked with a number of professional companies including Iron Mountain Theatre, Theatre Alberta, The Lovers Cabaret, Safeword Dance Company, Elope Theatre and The Gold Fever Follies. Cleo is currently a full time dance teacher with students of all ages. Her number one passion is inclusive, accessible and engaging arts education, and she is grateful to be able to teach in a wide variety of different communities. She could not be more excited to be teaching at Kids in Motion! Chantelle Smook was born and raised in a small town in Alberta. She started off dancing at age 5 with Ukrainian dance and from there branched out into other styles like ballet, jazz, contemporary and hip hop which then lead her to train with Niki Hofer, Rae Gale, and Alexander Chung in Edmonton Alberta. At the age of 18 Chantelle moved to Vancouver to pursue dance as a career by training under Moe Brody in the Intensive Training Program. In this year of study, Chantelle practised dance as well as learned new skills like silks, trapeze, hoop, and trampoline, singing and acting. From this she realized her passion for hip hop dance and is currently training with the Kill The Lights dance company with Shauna Smith and Ken Yung. Chantelle is really excited to share her passion of dance with the kids in motion dance studio and to provide a positive space for personal growth for her students. Zarina first began her dance journey at 5 years old in front of the TV in the living room, copying as much as she could from music videos and Bollywood films. Fuelling the passion of this young performer, her mother put her into Polynesian dance lessons. After 4 years of a variety of cultural dance lessons, Zarina took a break from dancing and turned her attention to athletics and sports. She reunited with her passion of dance at the age of 16 and began training in all styles of dance from ballet and contemporary to hip hop and street styles. She has danced for several dance crews including Red Tape, Rhythm Influenced, Breed OCLA and is currently a part of Illustrative Society. Zarina has also taught and directed for La Riva Dance Studio, DREAM Dance Studio, The Creative Outlet, Boogiezone Utopia, Boogiezone Xchange, Dance Downtown, Endorphin Dance Rush and Made Talents. Driven by her passion, Zarina loves to collaborate with other artists and students, always pushing herself to grow and inspire everyone she works with. Chelsea Goddard is an emerging performance artist creating on the unceded traditional territories of the Squamish, Musqueam and Tsleil-Waututh nations. Originally from Williams Lake, she moved to Vancouver to study dance at Simon Fraser University. There, she was given opportunities to work with such dance artists as Chengxin Wei, Meredith Kalaman, KT Niehoff, Rob Kitsos, Justine Chambers, Company 605, and Tara Cheyenne Performance. Chelsea holds a BFA in dance and is currently working as an independent artist and dance teacher. Chelsea is excited meet her new Musical Theatre classes at Kids In Motion this Spring! Megan has been dancing since the age of four. In 2016 Megan graduated from Shelley’s Dance Company in Edmonton, Alberta where she trained in jazz, contemporary, lyrical, ballet, pointe, hip hop, musical theatre and partnering. 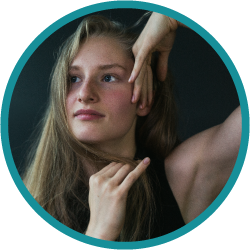 Throughout her teen years she has received numerous scholarships to train at Harbour Dance Centre, Broadway Dance Centre, The EDGE in LA as well as many conventions. Megan was very fortunate to attend many prestigious summer intensives including Boston Ballet’s SDP, Alvin Ailey American Dance Theater summer program, Joffrey Ballet’s jazz and contemporary as well as pre professional ballet program and The Next Step in Los Angeles. Her dance career has allowed her to travel to many places such as Los Angeles, New York, Florida, Vancouver, Phoenix, Boston and Budapest, Hungary. Megan has completed Harbour Dance Centre’s Intensive Training Program and is a member of the Aviary dance company, which gave her opportunities to perform at Rogers Arena for WE Day, training at Vancouver’s Circus School, being in Telus Story Hives music video Serpentine Fire, dancing in films through Vancouver Film School and many more. This past year Megan and her teammates in Aviary put on their very own show called Reactive showing choreographic works of company members. Megan is looking forward to a great year and can’t wait to dance with you all.